Weak shares and bad economic data brought back distrust to the global financial markets. One of the most affected major currencies is the EUR. Anyway, have a nice day and good luck in trading. The EUR makes further losses against the JPY and the USD while negative economic data in the Euro-Zone and a lot of other nations including the United States and Asia, decreased the optimism about an economic recovery. The EUR reached for a fourth day losses against the JPY as Asian and European stocks fell, which cut the optimism and confidence around the world. Today, we are expecting more negative data from the Euro-Zone while a report is expected to show that the unemployment rate in German, which is the biggest economy in Europe, climbed in October. A survey showed that the jobless rate in the nation may climb to 8.3 percent from 8.2 percent from the previous month. Yesterday, the S&P 500 Index dipped 2 percent while the MSCI Asia Pacific Index of regional shares fell 1.5 percent and the Nikkei 225 stock average slid 2 percent. Yesterday, the EUR/USD reached a low of 1.4691, which was the weakest level since October 12th. The EUR/JPY fell to 133.12 after it reached a low at 132.81. The NZD/USD was close to its lowest level in three weeks after the RBNZ left the interest rates unchanged and signaled that it won’t raise until the second half of 2010. The NZD/USD fell for a sixth day after it fell over 3.2 percent yesterday before it reached a low of 0.7163, the lowest price since the beginning of the month. 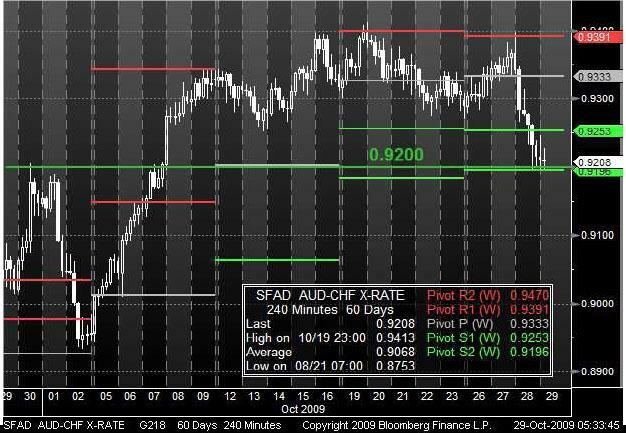 After touching the first Pivot Resistance level at 0.9391, the AUD/CHF fell down with a break through the middle Pivot point at 0.9333 and the first support at 0.9253. Now the market trades on the 0.9200 support level from the end of the previous month, which is similar to the second pivot support of 0.9196. If the pair breaks these support levels, we may expect more losses. Otherwise, it could return back towards the middle pivot at 0.9333. 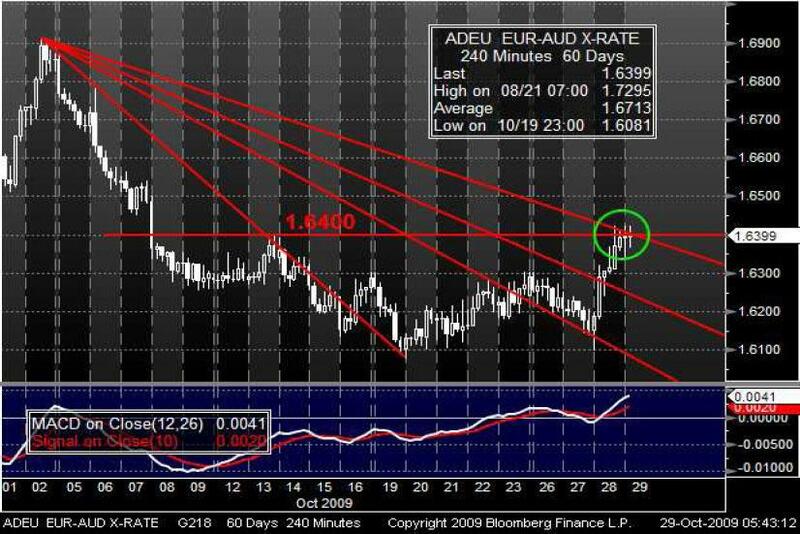 The EUR/AUD has entered and reached the upper line of the bearish Fibonacci fan. Additionally, it is trading on the resistance level of around 1.64 which is the highest since the middle of the month. The MACD may indicate further gains, which could assist the bulls to break through both resistance levels. If the market crosses the resistance levels, it may make further gains.